Finca Zarita is registered with the Andalucia Tourist Board No. RTA.VTAR/CA/00582/ as required by law. 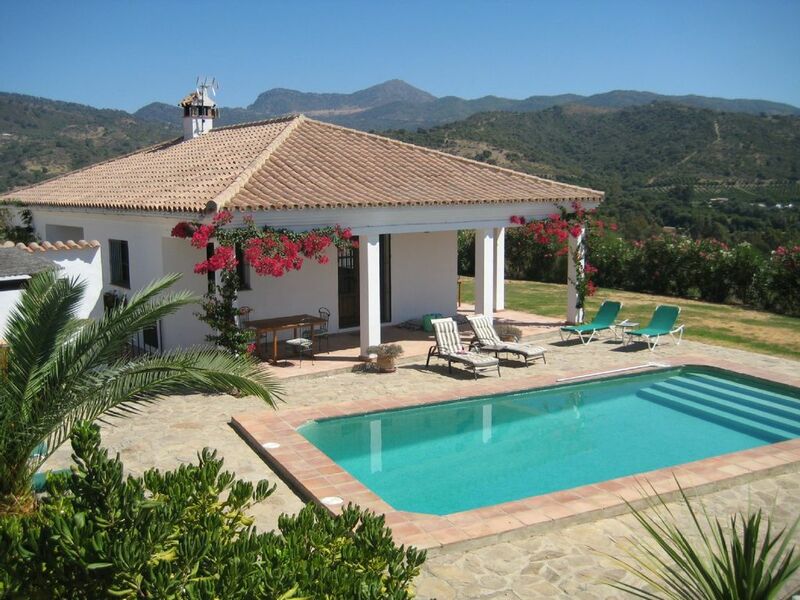 The villa offers an unusually high standard of accommodation with its large, spacious rooms. It is approached by its own drive and is entirely private. The accommodation offers two large en-suite bedrooms, one with a double bed and bath and the other with two single beds, a cot and a shower. Both have large fitted cupboards. The living room is 10m x 7m with a wood-burner at one end, satellite TV, DVD player, telephone & broadband connection with WIFI. A large picture window overlooks the valley. The well equipped kitchen area is on the west side and includes dishwasher, fridge/freezer, electric oven, gas hob, and electric coffee machine. The utility room is off the living room and has a washing machine, sink, additional WC. French windows lead from the living room on to both the east and south facing terraces. The pool, 8m x 4m is right beside the terrace and there is about half an acre of garden which includes an area shaded by ancient olive trees. There is a brick built BBQ. The property has recently been sold and the new owners have repainted and decorated inside and out. It still retains its very high standards. I ran the property for the previous owners for 5 years and now run it for the new owners, so I have an in depth knowledge of the property and how everything works, and also of the surrounding area. Location, location, location. Away from it all yet only 1.5km from the convenience of the village which has all the shops you need. Surrounded by some of the most spectacular country in Andalucia and with a water supply from the River Guadiaro which is the only river in southern Spain which has never been known to dry up in summer. Due to the 300 days of sun throughout the year in this part of Spain and the increasing demise of the planet, in May 2016 this property was converted entirely to solar power with the backup of a generator for use when the system is overloaded or there has been no sun. So there are no electricity bills to pay! We do ask our guests to be mindful that it is a solar system and to operate the heavy use electrical appliances washing machine, dishwasher,etc. during the day rather than at night when there will be no sun to recharge for the batteries. Both bathrooms are fully tiled and have hand-painted basins from Seville, WC and bidet. Bathroom 1 has bath with shower over and Bahroom 2 has walk in shower. Third WC and sink in utility room. 100% cotton sheets. Bottom sheet and duvet in spring and autumn, two sheets and optional light cellular blanket for summer. A lovely large airey room with views across the valley and french doors opening on both sides. Warm in winter, cool in summer. There is a table that seats 6 inside the house and similar sized tables on both terraces outside. Large covered terraces on two sides of the villas so you are sure to have shade at all times of the day. Nearest court in Jimena, 7 km away. 8m x 4m with steps right across at the shallow end making access easy for the elderly and the very young. Reservations are confirmed by payment of a deposit of 25% of the total amount. The balance is due 8 weeks before arrival. We loved the Finca so much! Although stunning I believe it still has a homely feel and is really well kitted out so that you settle in straight away. We particularly loved the dining table under the veranda and near to the BBQ. The scenary is spectacular and the peace and quiet was much appreciated! We had a lot of relaxation but also some days out - to Gibralter, Ronda and Water parks. There are also plenty of walks when it's not too hot. The supermarket in the local town - San Pablo - was great for everything we needed and the local restaurants are also excellent. Julie was very welcoming upon arrival and very helpful with any queries we had. All -in-all a brilliant experience. Thank you so much for your review, I’m so glad you enjoyed your stay and hope to see you again! Had a great week at the villa, lovely pool with great views. The house had everything we need, the local town is a few minutes drive away and probably walkable at the right time of day with a station if you fancy leaving the car and riding the scenic route to Ronda or elsewhere. Great restaurants within a short drive and not too far from the beach if you fancy it. Loved watching the shooting stars overhead at night and the eagles in the day. Julie was very helpful and informative and took care of everything we needed. A wonderful holiday. I’m so glad you all enjoyed your holiday, and thank you for the great review! We enjoyed 2 weeks staying here in July. Fabulous views and a lovely villa. Very private but still within walking distance of the village. Thank you Julie for all your help and local knowledge. We would definitely recommend staying here. Thank you for your review, look forward to seeing you again! Undoubtedly one of the best villas we have ever stayed in, both for location and for the house itself. The views are fantastic. It is up a cul-de-sac lane, surrounded by farmer's fields on 3 sides and on a field of the house next door on the 4th. Yet walkable to the village of San Pablo if so required - which has bars, little shops and a suitable supermarket. The pool is excellent as are the grounds and everything is well-kept and modern. All energy is sustainable solar - which may possibly limit the aircon when very hot. On our stay in June it wasn't needed at all. Sunday arrival? Use the petrol station in Estacion de Jimena for basic shopping including bread, which is baked daily. Hard to think of anywhere better and our host Julie, was extremely attentive pre-arrival and on arrival. Excellent villa in spectacular quiet location. Very private. We came here for a week's walking and had perfect weather, not too hot. The villa has everything you need there was enough sun to power the solar system which works perfectly. Thank you Julie for all your local knowledge. We look forward to returning next year. Our family enjoyed staying at Finca Zarita, it is a quiet place in the country side next to Jimena de la Frontera. The garden is children safe, nice swimming pool, gorgeous views on the mountains. The house is cosy and well equipped, especially with solar system that provides ample electricity and hot water. We would gladly come back and recommend it to anyone! Thanks so much for taking the trouble to write a review. So glad you all had a good time and hope to welcome you back another year. Finca Zarita is 1.5km from San Pablo de Buceite, halfway between the 'white villages' of Jimena de la Frontera and Gaucin and within easy reach of Sotogrande and Ronda. San Pablo adjoins the Parque Natural de los Alcornocales, the largest cork oak forest in Europe, which has excellent walking tracks with spectacular views. This property is entirely private and not overlooked in any way (except by eagles). Lying directly under the migration route, masses of birds of prey are often seen from the garden in spring and autumn. The area is famous for its spring flowers. The nearest beach is at Sotogrande, a 30 minute drive. Changeover day is Saturday unless other arrangements have been made. Prices include all linen and towels, gas, water, electricity in summer, weekly change of bedlinen, cleaning service before arrival and after departure, general cleaning materials. Please note that we do NOT supply swimming towels. This house is powered by solar energy backed up by a generator for when the weather is poor. Fuel for the generator is charged at cost during the winter months. Please note that the generator is used to recharge the batteries, not to directly power the house, so it will only come on occasionally in bad weather.